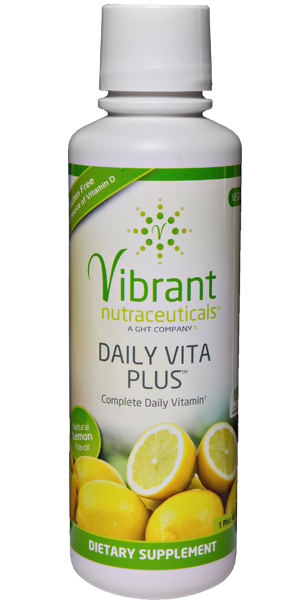 Daily Vita Plus is a power-packed combo of essential vitamins in bio-available liquid form. Just a one half-ounce shot daily delivers 100%-500% of the recommended daily amounts of 13 water-soluble and fat-soluble vitamins. Lemon Flavor. Some vitamins may help prevent medical problems, while others may maintain barriers to keep out bacteria and viruses, and a lack or low level of certain vitamins may develop deficiency diseases. 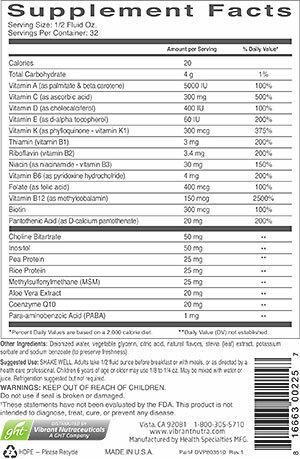 Vitamins can be obtained from a healthy, balanced diet, but for optimal health, a dietary multi-vitamin supplement may be required. A vitamin is an organic compound required in tiny amounts for essential metabolic reactions within the body. The term “vitamin” is derived from the words “vital” and “amine” (part of an amino acid), since vitamins are required for life. Vitamins work together with minerals, enzymes, and other nutrients, to produce health. Vitamins are essential for human growth and development, as well as for the healthy maintenance of all cells, tissues, and organs. Once growth and development are completed, vitamins remain essential to enable us to efficiently use the energy provided by the food we eat, and to help process the proteins, carbohydrates, and fats required for respiration. Sufficient daily vitamin intake may best be obtained by eating whole raw or slightly cooked foods. Supplementation may be necessary, however, because of inadequate intake or poor nutrient absorption. Most of us find that a busy lifestyle, excessive stress, or illness, can make getting enough good nutrition difficult or impossible. Vitamins are classified as either water-soluble, meaning that they dissolve easily in water, or fat-soluble, which are absorbed through the intestinal tract with the help of fats. Both types of vitamins must be taken daily. Water soluble vitamins do not store in the body, whereas fat soluble vitamins do, and Daily Vita Plus provides us with both types. Vitamin A – May assist eye function as well as respiratory, urinary, and intestinal tract health. May help regulate immune function, and support skin and mucous membrane. Helps with cell formation.